The May 2013 edition of our Fulbright New Zealand Quarterly newsletter is online now! 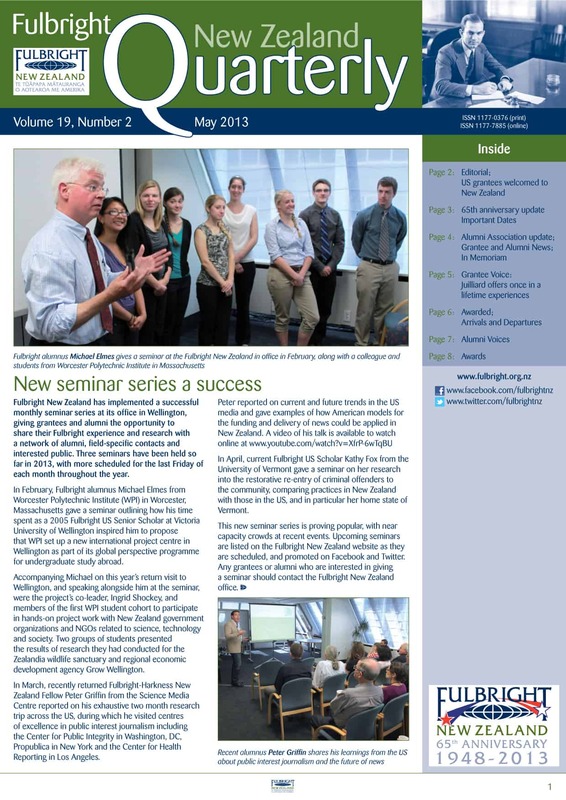 In this issue, read about the successful new seminar series held monhtly at our office in Wellington; our February orientation programme for newly-arrived US grantees; and an update on our 65th anniversary activities and plans. Current Fulbright New Zealand Graduate Student Bryony Gibson-Cornish reports on her exchange to the US, alumni Dan Bidois and Bill Tramposch reminisce about their Fulbright exchange experiences, and we have the usual news updates from the Fulbright New Zealand office and the Fulbright New Zealand Alumni Association, details of our latest grantees, grantee and alumni news in brief, and a full list of available awards.